The vanguards which our prosperity is most sensitive to as a nation are those who administer our legal and political structures. The fathers of our country foresaw encountering different forms of oppression. Just as Man designs durable products to withstand the natural elements, we devised a system to protect our life’s constancy; to protect us physically from any kind of invader. It was a great idea which would take our minds off watching our backs and leave us free to achieve, individually and as a Union. We created an organized body to whom sole authority to use force against those who threaten the nation’s people was delegated. Our physical protection was its onlyvalid function and concern. It was to leave all men free to pursue their survival by offering the results of their effort for a voluntary trade with others of the nation; our free system of commerce. Such a system was designed to protect the producers of life from the parasites of the living. The government was just an instrument of the people; it was not intended to serve as master; it was not to rule. It was to stand as guardian from any initiation of violence against men at any time; whether taking place in an alley, an office or a home. Weas citizens take care of the rest. It was to respond to the actualuse of force, where human lives are compromised by evildoers subjecting citizens to aninvoluntary circumstance. All other human action is voluntary, and therefore is supposed to be the object of their guardianship.Yet now, perceivedthreats are regulated; which simply means that laws are for sale. Any form of incarceration is a life-taking power, so such power must be exercised with the utmost care and the clearest reasoning. But what has transpired? The careful maintenance of individual freedom as technologies advance is clearly not the government’s trend or priority. Our representatives have violated the Constitution, allowing the government to break loose of its essential function to permeate and decay everything in its path. The evidence of degeneration is countless, whose aggregate result is our unjustifiable tax burden, our economic Fed-watching and the wild swinging in our scales of justice. There are now government agencies and government businesses competing in or constraining every major industry, most extensively in the credit markets; monopolies expropriating the benefits of freedom by those politically connected, to simply take it for themselves. In every instance outside its legitimate purpose, it has become a conspirator of the very evil we needed protection from, and now it is destined to enforce the irrational. On a common level, take for example the ludicrous injury judgments awarded by juries, the blaming of corporations for products used in self-inflicted injuries and the antitrust suits filed by our own government against private citizens who display the deepest vision, where alesssuccessful effort on their part would have shielded them. Imagine working your whole life and rising to the top of your field, only to be attacked by those who reserve the sole right to attackin matters of business, who decide that yourway is not the way to run yourbusiness any longer. Just when you should be getting the keys to cities and other honors, your brilliant ability to put together an organization that employs thousands and benefits millions is blasphemed and destroyed by the politician’s “expert witnesses”—men who are unable to stay competitive with you for the same reasons and means by which they propose to restructure your business. You are someone who has been building a better world in your every thought and action. It has kept you up at night, gotten you up early, and given you a more genuine pride and satisfaction than any other endeavor. As a result, your company has been voted the best alternative by everyone who seeks a voluntary purchase in your industry. Does it make sense that you are considered an enemy of the country? There is no greater corruption, no greater self-abasement for a country than to take our highest and best—those who deserve our most reverent salute—and rob them of their control as we wipe our feet on them. Throughout history, one empire after another has choked to death on its own red tape, and the first men to be sacrificed physically and legally—Abraham Lincoln, John Kennedy, Bill Gates—are always those of integrity in business and politics who are able to lead. Government is proper only as a consolidation of the right to use force against oppression. When wielded inappropriately, such as in initiation against private enterprise for a supposed “good cause,” it acts as a catalyst to bring about such a policy’s actual intention in defying nature; destruction. When this cycle begins, government becomes the most lethal enemy of the people, and only a return to sound fundamental principles can save them. Our government is no longer a pure vanguard of the people, no longer standing for American values alone, evidenced by our permeation of government enterprise, our trade status with slave nations and our debt-based currency system. It has become morally inconsistent and financially reckless, no longer guided but simply restrained by the original Constitution. Until and unless its motives are cleansed, we will continue to suffer a slow downward spiral back into another dark age. The most prominent opponentof morality began its life as one of the first abstract vanguards, which is not at all unusual. I saw how religion could be abused as a child and have been at odds with it ever since, but in looking beyond my own experiences, I discovered a crucial and redeeming truth: Many people who seek religious guidance begin with an honest desire for an explicitmorality. They want to find a clear format for living that allows them to feel good about their actions; they want to knowthat what they are doing is right. With all of the innocence of a child, that is just what I want, and have pursued since it was missed in my youth. Religion has dominated the subject for millennia; it is after all, theepublicly recognized domain of moral judgment, and was my first stop as well. As my studies continued to subdivide and move deeper, I understood that it was the intentional misuse of religion that I disagreed with, and thatallowed me to relax. So if you follow the flow of thought which has full validation in the natural world, you’ll understand that we quite possibly have the same benevolent motivation. If your religious premises are sound, they will not reject the nature of cause and effect either, nor our means to discover it.You will be able to identify which principles are life-furthering and which ones were “snuck in” to your faith over the centuries, to secure unearned benefits for the freeloaders. Early on, religion claimed the title of Moral Vanguard. Yet at the Vatican for example, actualmorality is lightly touched on and mostly avoided in fear of their follower’s discovery that they have no clear idea of what morality is,and that what they have compiled is a very confused, obscure, semi-rational, semi-evasive definition. Their undefined and indefinable basis for explanations is not a means of validation. Identifications and conclusions suppose a rational chain of knowledge—an epistemological chain. You’ll never witness their high priests in a public moral debate, vulnerable to having the world discover that they don’t have a leg to stand on. They preserve some semblance of dignity by handing down their senseless edicts while hiding behind a locked door. They are apprehensive of any argument regarding morality, because they sanction and exercise no fundamentally valid frame of reference, and they never will. To do so would be to wipe out their remaining power. Clinging to their own self-limited interpretation of their chosen dogma, they remain hopelessly behind the rest of the world in the understanding and conveyance of moral action. Life does not flow with the patterns these men attempt to dictate, and the whole world knows it. They have lost their power to compete for the minds of rational men, and I wouldn’t consider them a serious threat to western culture any longer. It is to the productive public’s intellectual credit that they have largely abandoned such sources for true moral guidance. Today, their statements are often treated on television news as entertainment. With the propensity of the press to exploit the obvious, discredit comes from claiming that they are “behind the times.” But “times” do not determine the contentof a moral code, only how it is practiced. It is their content and their means of its attainment which is unsound. Sound moral principles cannot go out of fashion; they are good for an eternity. For example, if you lived under censorship, openly sharing your ideas would get you killed; so until freedom is restored, in self-preservation the correct action is to withhold them. In a country of free speech and free men, your chosen career pays best when you openly share your ideas, so in self-preservation your correct action is to bestow them. When faced with the prospect of physical destruction, it would be immoral notto guard your life, by stopping or escaping those whose intention is to take it. In civil times, when one is able to address issues beyond sheer survival, it is morally right to expand the range of your knowledge and abilities, making life easier and more fun (as progress is a physio-intellectual necessity). “The times” change the form of our allegiance, but our objective remains the same; to preserve and further human life; vitally our own. The public’s lack of explicit understanding on the issue is evidenced in that most do not recognize their daily, self-sustaining actions as moral. The Vatican’s actualdiscredit is what is responsible for this: in their unwillingness to recognize that Man’s lifeis the object of a rational moral code, and that the preservation of lifeis its purpose. Understand that the populace may have lost touch with the Vatican; but they have not lost touch with religion as such. The world’s most widely recognized set of moral principles became one of the first mass-scale abstract victims of the Spirit Murderers. Religion was intended as a standard of action for men to live by, and yet it has been slammed into the wall and ridden into the ground just like any other unguarded value. Those seeking a buffer between life and the effort to deserve it have always been on the lookout for a means to obtain values without thinking or working. They saw how powerful a moral code is, how desperately it is sought by men, and they schemed to subvert it. It was their contradictions with the nature of existence that inventedhypocrisy. Such a painful, heartbreaking and undeserved moral guilt¾that one cannot be moral if one takes the actions necessary to exist; that one has failed one’s Lord and one’s self¾is all they have to offer their followers now. It shocks me that someone can be stopped from pursuing knowledge, such as reading an important book or carrying on scientific or commercial work, due to the unsubstantiated condemnation of it by moral frauds. It is a frightening glimpse at just how primitive and influential their horror psychology, such as “You’ll go to Hell if you even think it,” can be. Through guilt or just the threat of potential guilt, Man can be controlled; and control of men is never a truevanguard’s intention. For the most part, religion, astrology and other popular forms of mysticism give me the creeps. It is not necessarily the mediums, but the interpretation and expectations of the audience that I find unsettling. As in religion, my contempt is reserved for followers who are willing to negate their consciousness (which true professionals in such fields will tell you is improper) in favor of external drivers. They float through their lives like pieces of driftwood, revering unaccountable forms of knowledge, while neglecting the provable and consistent ones. Abandoning reason, their fate rests in the stars or in the hands of others, but never in their own, where it belongs. Their future and esteem hinges on anyone’s opinion, and the less it is substantiated the more it is heeded. Such people are looking for a way around thought for a very specific, self-abasing reason. Fools misuse mysticism, but it canbe productively utilized by the rest of us upon reaching a certain intellectual level. The field is important as it often encompasses the cognitive unknown, mislabeled as the unknowable.Some attributes that are considered mystic, I am inclined to support. In time I expect to see them accepted as actual human capacities: as part of the knowable, natural world, releasing new keys to spirituality which the mind-negating fools never could have achieved. Their contemplation is very interesting, but still I say to all of mankind, master what is here.Your mastery of and action taken on what isunderstood within a sound philosophy, is what provides you with the personal inertias that such mystic techniques measure and project. Their job as Moral Vanguard is to help you see where your momentum is leading. Master existence first, and then build to new discoveries. Whatever you find interesting, a clean philosophy will make your exploration of it efficient, decisive and more enjoyable. You will reach answers sooner and be able to move deeper; answering questions that right now, you could not possibly comprehend. Mysticism at best is a compass. A proper moral code is a global positioning system, 455 horsepower, and a full tank of racing fuel. The true abstract vanguards are those who projectideals through specific mediums; the artists and the stars of field, stage and screen; those we voluntarily boost to their heights by individual sanction;by purchasing movie tickets, attending concerts, buying books, going to stadiums, etc. They are our public heroes. Not all celebrities are moral just as not all public sanctions are rational, but the mediums they reach us through are sound. The most significant medium of the abstract vanguards—when precision is required and nothing can be left to implications—is literature. It addresses the mind directly. Others such as sculpture, painting, music and film, can share what exalted states can be felt while living, but can’t explain the means of achieving them. Next to literature, the most significant medium is what doesshow you; the productive coexistent activity of men: business. Actually, all of the tradable products of Man, be they automobiles, wedding dresses, medical skills or artistic creation, are subsets under the category of business. There is no greater moral education in action than American free trade; and the freer, the more refined the lesson. It is the best, as it addresses every possible subject of interest to human beings, tailoring lessons to every ambitious mind. Free commerce makes available every bit of marketable knowledge and makes careers possible in anything imaginable. Most importantly, it teaches men the processof utilizing a mind to its proper boundaries of productive creativity—a moral process. The ways to approach a career or business endeavor and therefore the sustenance of a life, are as wonderfully varied as the number of men on the planet, when they are free. So what is myrealm as Moral Vanguard? Simple. The protection, development and exaltation of all entities of volitional consciousness in their domain. To shield the world with my body if necessary, for I know by how Ifeel about living, the glory all of mankind could feel about their lives, and who deserve an unrestricted attempt. Now it is time to decide what yourrole is. Yes, there are things wrong with the world. Yes, sub-humans stand in our way. So what! We’ve all had experiences that end up limiting our emotional freedom through traumatic events and those who have hurt us, where we have to lock away a part of our heart¾the part that grants faith¾possibly forever. 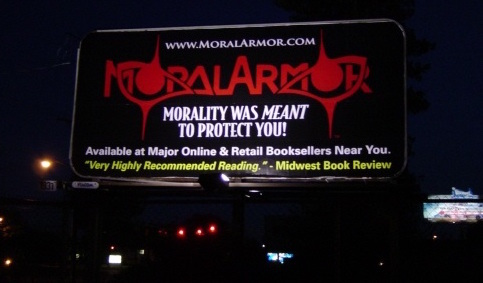 Such an experience was the genesis of Moral Armor.But there is still some part of us that needs to reach out and connect, and feel the warm safety we felt in an adult’s lap. We needguardians. And then there’s the side of us which is confident and sensual, that longs for the raw, primitive release of our deepest passions, that calms us and keeps us on track. But it’s a jungle out there. The proper moral armor can lead us to those who are safe to turn to in these vulnerable instances; and any other time we care to be fully coherent of our choice. Such integrity is our foothold, for when it is time to stand alone. Sometimes we must have it understood that we need to remain independent. That there are certain things we don’t want help with. That we will find healing on our own, and in our own way. That we need solitude; to run away, to not call, to not consider, to just be alone and exist for ourselves, sometimes. I ran away to complete facets of my own chain of knowledge. I used to think, “I don’t want help; I can do it myself.” Now I know that what drove me away was the natural fact that one man’s integration cannotbe done by another. I cannot convey all of the peace this solitude has given me. No matter what I have experienced, I have a priceless faith in mankind which grows from my own motives, actions and sense of life. I have always used myself as the gauge of moral action and for my view of Man, and so have you, whether you are conscious of it or not. Because of my introspection and all that has developed as a result, I know what we can be. What we are driven to do and what drives us, has a much greater self-impact than any action taken by others. You can never simply obey others who tell you what is right; you must judge for yourself. You must get away and take the time to understand. Understanding and choice is the essence of morality anyway. What we are and what we think is wholly our own; it is not to be determined or touched by the outside world. Whether or not others played a part in influencing what we have become, we still had to accept or reject the soundness of their authority. And whether we bothered to check their claims or not, what we have concluded is a reflection of our own intelligence and character. In our lives, we are and always have been the ultimate Moral Vanguard.